“Music and fashion are a huge part of how we express ourselves to the world,” said Matt Fidler, co-founder and chief marketing officer for Furrion. “Consumers can select one of the three luxurious designs that suit their personality and be confident that the LIT can handle any activity they choose. 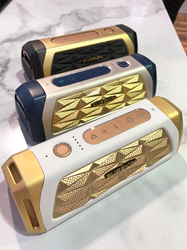 Furrion, a global leader of innovative products and solutions, launches its new wireless outdoor Bluetooth® speaker, the Limited Edition Furrion LIT. The Limited Edition Furrion LIT features the entire technical prowess of Furrion’s LIT speaker and with a stylish twist. Luxurious designs with 18K gold, leather trim and Swarovski crystal embellishments truly make these speakers stand out. These stunning new speakers are waterproof, shockproof, sandproof and come with a built-in flashlight. Available in three distinctive designs the Limited Edition LIT is certain to be a centerpiece in any home. Consumers can select from a platinum body with navy alligator designed leather trim and Swarovski diamond accents or the opulent 18k gold body with black carbon fiber trim or the sophisticated white leather body with 18k gold ends and Swarovski diamond accents. All three designs feature a unique geometrical angular designed speaker grill and an 18K gold brand emblem. While the Limited Edition LIT speakers are beautifully designed they are certainly more than just looks and are packed with innovative features. A built-in 100-lumen flashlight and emergency SOS distress signal gives you peace of mind. Clear wireless music streaming via Bluetooth and NFC technology ensure that you can enjoy 360 degrees of immersive sound wherever you go. A pairing option allows consumers to connect two speakers together for bigger sound, creating a party vibe anywhere you travel. For convenience, the speaker also offers an audio-in connection, allowing it to connect to other devices. The speaker is waterproof with an IPX7 rating. A built-in microphone allows the Furrion LIT to double as a speakerphone for hands-free calls. The microphone also works with Siri® and Google Now™, providing an added layer of convenience for consumers. The Limited Edition LIT charges quickly via USB, and its rechargeable battery provides up to 15 hours of music playback. A very limited quantity of these exclusive designs will be available in the fall of 2018. Furrion (http://www.furrion.com) is a global technology company that designs and manufactures products and services that enhance consumer lifestyles. As a leading supplier of luxury products to various industries, Furrion’s portfolio includes electronics, appliances, renewable energy, automotive navigation, information technology, power management systems, electrical components and robotics.